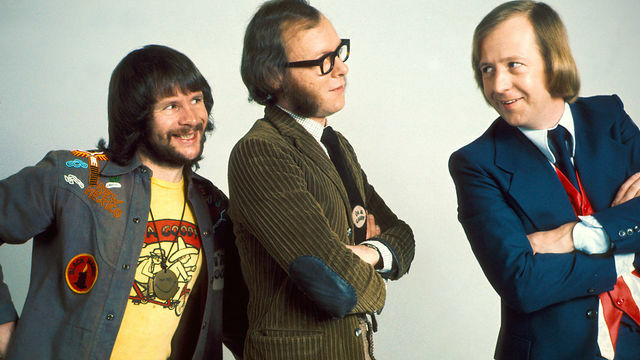 The Goodies’ three-seat, three-wheel ‘trandem’ cycle gets three punctures. Wrestling star Big Daddy lends a hand and inflates the tyres with his mouth. But he blows so hard that the Goodies themselves are inflated like balloons, and they float off over the treetops. Sketch with Conservative Party leader David Cameron from Comic Relief 2007. ‘No!’ shouts Cameron in mock exasperation as members of the shadow cabinet hugged the Goodies. ‘I said a hoodie!’ This was a reference to his so-called ‘hug a hoodie’ speech about youth crime. The appearance on the show won him admiration for being a good sport. The ‘shooting’ scene is a Goodies classic. The boys are hired as park rangers for Queen’s Park in London. As they are riding their trandem in the park, they hear a crowd shout: ‘Shoot!’. Thinking they are about to be shot, they dive to the ground, only to discover that the noise came from spectators at a nearby football game, encouraging their team to score. A satire of industrial unrest at British Leyland plants, as the Goodies get involved in industrial action involving a different kind of plant: British Leylandii. They organise a ‘grow slow’ (a reference the ‘go slow’ tactic employed by unions at the time). But the tactic backfires because people are delighted that their hedges don’t need pruning so often. Meanwhile, in a clever parody of the recent miners’ strike, the country is paralysed by a ‘minus strike’, as mathematicians, stockbrokers and accountants refuse to use minus signs, thus making it impossible to do subtraction, and causing rampant inflation. Two rival guerrilla armies are at war. One is from Gibraltar and dress as monkeys (hence ‘gorilla warfare’). The other army are Spanish transvestites who wear lingerie-style corsets and are known as ‘basque separatists’. After the programme was transmitted the production company received a letter purporting to be from the Basque separatist group ETA, accusing the Goodies of trivialising the issue of self-determination. ETA denied all knowledge of the letter, which was subsequently revealed to be the work of the Goodies Appreciation Society at Oxford University. Sketch with Jade Goodie from Comic Relief 2006. Jade (‘Goodylocks’) comes home to find three Goodie Bears in her house. In this episode the Earth is invaded by UFOs shaped like fried eggs. It is best remembered for Stand On One Leg and Do The Fried Egg – a spoof of the disco dance crazes that were sweeping the nation. The song was released as a single and reached the top ten in 1975. A parody of Dante’s Inferno. The Goodies are trapped in the Tenth Circle of Hell – which turns out to be Hull, where they are forced to listen to Des O’Connor records and watch Bob Monkhouse. Bill remarks that ‘things can’t get any worse’ – at which point Tony Blackburn (played by himself) walks in and says ‘Hi everyone, who wants to hear my new song?’ Bill and Graeme groan and Tim pulls out his hair. One of the lesser-known episodes, but a great favourite among Goodies connoisseurs. The Goodies dress as golliwogs and satirise racial prejudice as they suffer discrimination from ‘gollywigs’ – gollywogs with blonde wigs. A satire of party politics, in which Tim becomes Prime Minister and tips custard over the heads of any politicians who do anything stuffy or boring. In your piece on the Goodies I failed to spot any hint of irony. Are we to conclude from this that you yourself are a Goodie-fellow traveller? I remember I used to watch the Goodies with one hand in front of my face in order to hide Bill Oddie from my view. Such was my hatred for his clean, safe, Hippy (but not really) look – Cambridge Hippy-chic?